When Yoko Nomura moved from warm, dry California to the subtropical island of Okinawa, she was struck by the stifling heat and humidity. Searching for ways to survive the Okinawan summer months, Nomura, from the Science and Technology Group at the Okinawa Institute of Science and Technology Graduate University (OIST), discovered a traditional secret to keeping cool: a material called Basho-fu. Basho-fu is an Okinawan textile fabric made from banana plant fibers. Originating from the 13th or 14th century, Basho-fu was used to make traditional Okinawan kimonos. Basho-fu kimonos were popular among all classes of people in the Ryukyu Kingdom, which ruled Okinawa from 1429 to 1879. Basho-fu textiles were highly durable for hard labor such as farming and fishing, and were comfortable to wear in the hot and humid subtropical climate of Okinawa. Cultivation of Itobasho, a type of banana plant that is used to make Basho-fu. The skill and expertise required to make Basho-fu textiles have been passed down through generations of craftspeople in Okinawa. However, the traditional craft is now under threat from a shortage of banana plant materials and an infiltration of modern methods. In an effort to rescue and document this important part of Okinawan folk culture, researchers from OIST, in collaboration with the University of the Ryukyus and the Kijoka Basho-fu Association, have used scientific techniques to characterize Basho-fu materials and to compare traditional and laboratory Basho-fu production processes. The weaving process, which is part of the long and complicated traditional production process of Basho-fu. In their paper, recently published in the Journal of Fiber Science and Technology, the researchers used one of OIST’s Scanning Electron Microscopes to observe the structure of the Basho-fu materials in high-resolution. They also used other analytical techniques, such as X-ray diffraction, to investigate aspects of the chemical structure of the material, including crystallinity and molecular bonds. “Our first finding was that the outer part of the harvested leaf sheaths, which is the part of the plant used to make Basho-fu textiles, contains many vascular bundles,” says Nomura, lead author of the paper. Vascular bundles are collections of conducting vessels used to transport water and nutrients in the plant. The presence of vascular bundles in Basho-fu material makes it highly breathable, keeping the wearer cool on hot days by allowing sweat to evaporate through pore-like structures. 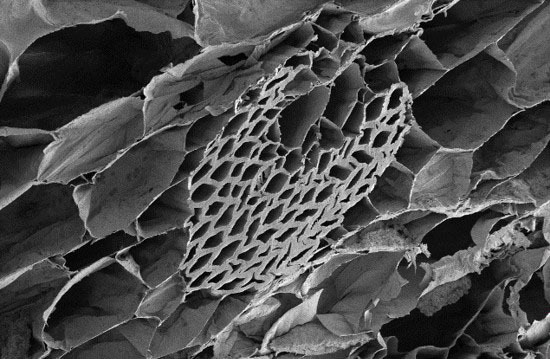 Magnified image of vascular bundles after traditional degumming in ‘Naha-u’, the outer part of the banana plant leaf sheath that is used to make Basho-fu. “Next, we compared Basho-fu materials that had been made using the traditional degumming process with those made using modern laboratory methods,” says Nomura. Degumming is one of the refining steps in the long and complicated traditional Basho-fu production process. The researchers found that, although the vascular bundles remained in the material after both traditional and laboratory degumming processes, the laboratory-made materials were lower in quality. Material that had been subject to laboratory degumming showed some additional changes compared with material that had been traditionally degummed. For instance, some of the vascular bundles in the laboratory-treated material were flattened, with fewer air voids. This shows that the traditional process of degumming is milder than the laboratory process, retaining more air voids and therefore maintaining greater breathability. Although the traditional method is more difficult and time-consuming, it is more delicate and produces Basho-fu textiles of better quality. Toshiko Taira, a living national treasure who made great efforts in the conservation of Basho-fu for the Kijoka Basho-fu Association, was herself certified as an Important Intangible Cultural Heritage. 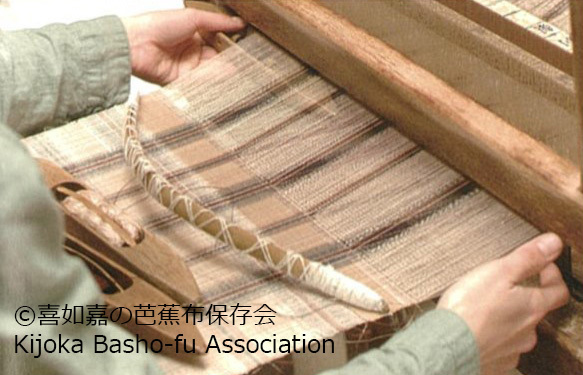 The next step is to analyze other features of the Basho-fu fibers and other steps in the long production process. 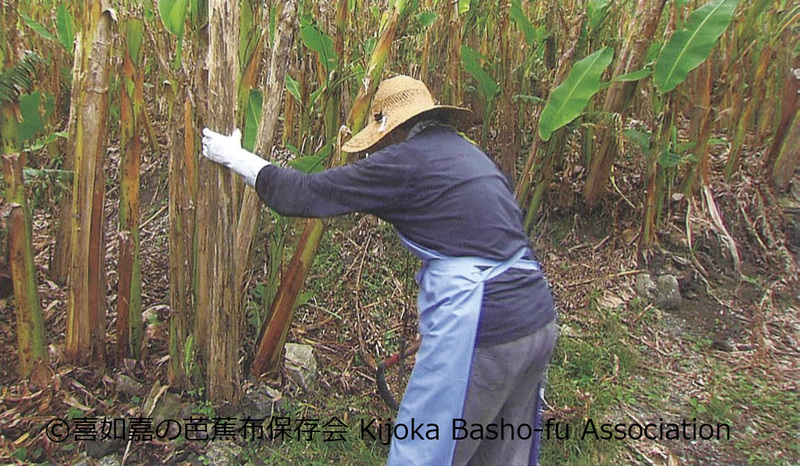 Present and future studies of banana tree fibers will help to conserve the traditional Okinawan craft of Basho-fu, and may also aid the development of new textile materials.